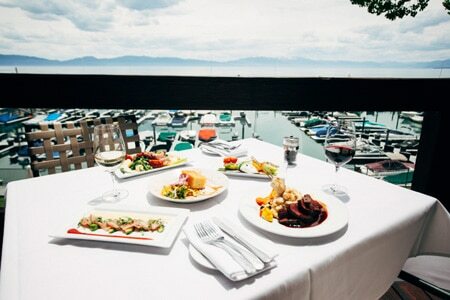 Established Tahoe City restaurant known for casual, waterfront dining with a view of the marina. : Jake’s could be like some waterfront restaurants, content to let the location do the work. But the kitchen is more ambitious. The menu, while not extensive, offers tastes from both land and sea. Orange chili sauce spikes a seafood cocktail. Lamb ribs soaked in a sweet hoisin sauce are a nice complement to the lake view. Ahi poke rolls offer just enough sesame, and a jícama and pear slaw with toasted almonds adds a crunch to the diver scallops. For dessert, break out the spoons and share the hula pie made with macadamia nut ice cream. Jake’s has a stone fireplace and a comfortable, beamed interior. Live music keeps the bar hopping on Friday nights.